Machine Zone's war-themed mobile game Mobile Strike will get a commercial on Super Bowl 50, the ad's star, Arnold Schwarzenegger, confirmed Wednesday. Schwarzenegger, who is making his third straight appearance in Super Bowl ads, appeared on the Super Bowl's Greatest Commercials special on CBS last night, and introduced the teaser below. The teaser and the ad itself were created by twofifteenmccann and directed by Henry Hobson of Furlined. "If you can't play in [the Super Bowl], at least be part of the commercials. It's a great honor to be part of this," said the actor and former California governor, who appeared in a trailer for Terminator Genisys during last year's game and in a Bud Light spot the year before. 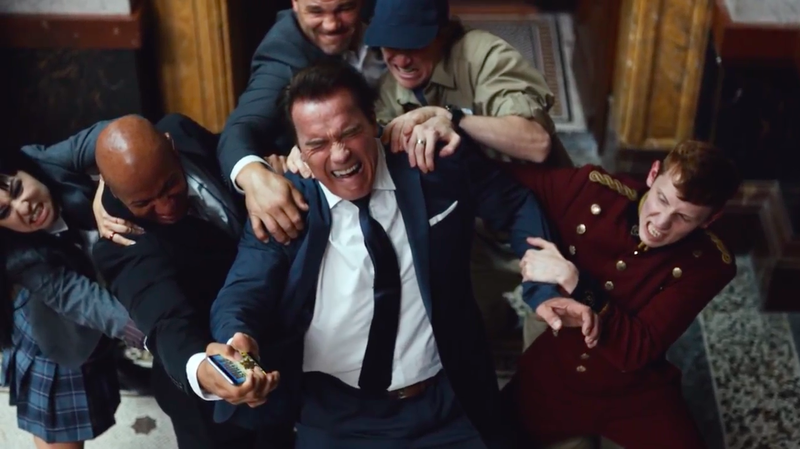 The teaser shows Schwarzenegger playing the game on a phone and a tablet as he walks through his everyday life, which is suddenly transformed into a battlefield. At one point he uses the tablet as a gun. Schwarzenegger has been the face of the game since its launch last fall. "It's an exciting game," he said Wednesday of Mobile Strike. "It's really like the commercial shows, with the game coming alive. … You're in the middle of all this unbelievable action." No details about the Super Bowl spot itself were available. Twofifteenmccann has posted a 30-second spot that is similar to the teaser on its website. Machine Zone aired a spot in last year's Super Bowl starring Kate Upton for Game of War: Fire Age.